In Paul’s first letter to Timothy he tells us that we come into this world with nothing and that we can take nothing out of it (1Tim. 6:7). However, this doesn’t stop us from accumulating a bunch of stuff in between. One of the defining marks of our society seems to be the accumulation of things. Some of the stuff we accumulate is functional and makes life a little easier; other stuff is more personal and serves to remind us of special moments or people in our lives. Then there’s the stuff that seems to serve no purpose at all; the stuff that just seems to mysteriously appear. Even though this stuff just seems to clutter things up, we can’t seem to get rid of it. It takes up space in junk drawers, on the top shelves in our closets and in our garages. It just seems easier to hide it in some out of the way corner than to actually throw it out. While superfluous clutter is annoying, it usually isn’t harmful. The same thing can’t be said about the emotional and spiritual clutter we allow to accumulate in our lives. Let’s face it, life can take its toll. Long gone is the blissful ignorance of youth. As we grow we learn quickly that life is not always fair. Solomon wrote, “there are righteous people who get what the actions of the wicked deserve, and there are wicked people who get what the actions of the righteous deserve” (Ecc. 8:14). Almost everyone who has lived any time at all has firsthand experience with this truth. In addition to the injustice of this world, we all deal with pain, death, betrayal and disappointment. 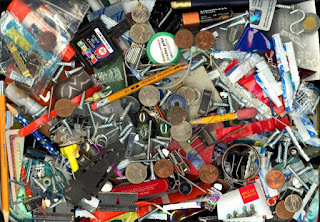 Each can add one more unwanted item to the junk drawer. Over time we begin to feel the weight of this clutter that accumulated in the dark corners of our lives. It begins to slow us down and prevents us from fulfilling God’s plan for our lives. It can make us bitter, apprehensive, hesitant or just plain scared. It weakens our faith. The writer of Hebrews tells us that we must “lay aside every weight and sin that so easily ensnares us, and run with endurance the race that lies before us…”(Heb.12:1). The idea of laying aside sin is pretty straightforward. We cannot pursue sin and God simultaneously – we cannot serve two masters. The “weight” to which he refers is a little less obvious. It’s the drawer full of hurts and resentments that have accumulated over the years. It’s that box of skepticism and disbelief that is stored on the top shelf in the closet. It’s the distrust that was swept under the bed. Sure this clutter has been hidden away, but it is still there. It is still weighing us down. Some of us have had this clutter so long that we’ve forgotten that it was there or even where it came from, but it is there none the less. Thankfully, the next verse tells us how we can lay down these weights. It says that we need to keep “our eyes on Jesus, the source and perfecter of or faith... (12:2). Keeping our eyes on Jesus helps keep things in perspective. It reminds us that no matter the situation, He is sufficient. Keeping our eyes on Jesus reminds us of who He is and who we are in relation to Him. It reminds us of what He did on our behalf and of His words on the cross, “Father, forgive them for they know not what they do.” Remember, those words were spoken while He was hanging by nails in His hands and feet. How’s that for perspective? Through His death He affected forgiveness for us and made it truly possible for us to forgive others. He conquered death and freed us from the fear that invades our lives. He has given us a reason to believe and through Him our faith can be made perfect. Can we even dare to imagine life without all of the resentment, fear and faithlessness that clutters it up? Can we dare to live and love free of the weights that ensnare us? 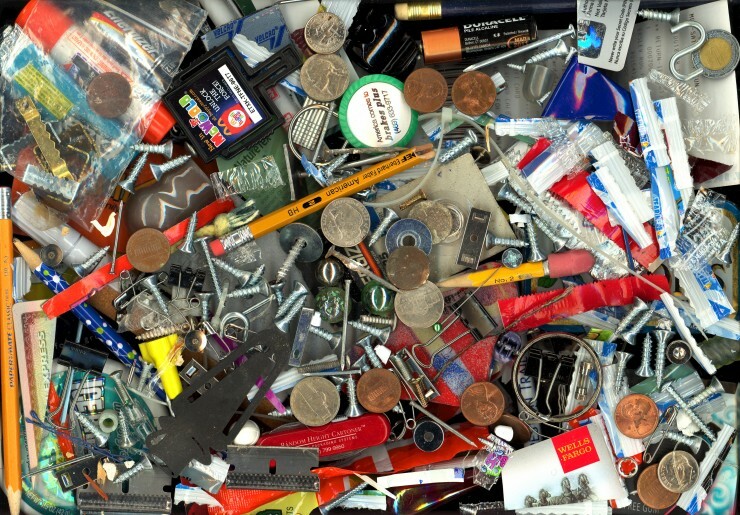 Can we dare to clean out the junk drawer and accept the ‘abundant life” He offers?